You can trapunto ruler work quilting just as you can trapunto any quilting or applique, so I used trapunto to highlight the various “zones” within my recent ruler work feathered wreath. You can see in the shot above that this allowed me to dramatize the wreath as a whole, but it also allows me to have the viewer appreciate the multitude of “design zones” that comprise the wreath. This is pretty easy to do and I’ll outline my steps below. By laying it out in this way, I’m hoping you will see the power of trapunto evolve literally before your eyes. I’ll post more once my outer border has been quilted… It might be awhile. I hope I’m not boring you with border designs created from arch/swag border “frameworks.” These are endlessly fascinating to me and they stitch up pretty quickly, so I just keep cranking them out. The design above features the crosshatching in the upper section and I really like the “sparseness” of it. There’s enough cross hatching to create interest but not enough that it becomes a dominant part of the design. Another “plus” is that there’s so little of the cross hatching that the stitching goes very fast. The design begins by creating a basic arc border framework using an arc ruler. I used the PTD 12 arc ruler, but again, you can create these types of designs with any arc ruler. I then added a scant 1/4 inch channel to make the arch more defined. This next step is where the curved crosshatching begins. Sticking to just one side of the arc framework, I used the etched lines on my PTD 12 arc ruler to stitch (3) 1/2 inch wide channels, then repeated the same thing on the opposite side of the arch framework. This left the small triangle at the center base. To make it more intricate, I then added a scant 1/4 inch wide channel inside it. Now the real “bones of the design were complete. I heard from several people who wanted to know how I made this ruler work feathered wreath, so the tutorial that follows outlines the steps. When I set out to do something like this, I don’t have the full thing composed in my head, so I’m making up the wreath as I go. Sometimes I learn difficult lessons by working like this and other times the universe is smiling on me and everything works out great. The difficult lesson I learned on this one was that I should have started with a much larger fabric block! I started with a 20 in square block but wish I’d started with a 24-26 in square block. If you make this wreath, start larger and you can always trim it if you don’t want to do something with the surrounding zone. 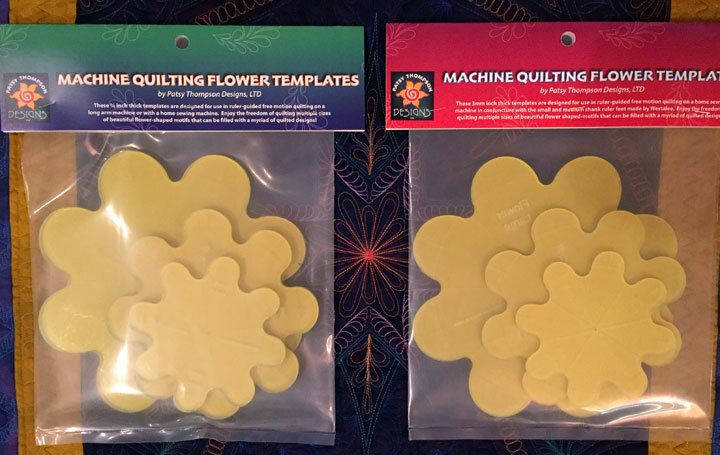 Step 1: I used the PTD flower templates to create the center. I used all 3 templates, set in concentric flower format. You can see a short video of me doing that on my previous post by clicking here. 1. Anytime I am filling a space with a featherette, I start by stitching that center-most plume, then I keep reflecting off what has been stitched to fill each side. I usually have a soap line that runs down the center of the space to help me keep things centered. 2. I know of 2 ways to create the plumes on a feathered wreath. You can take a stencil that flows from roughly the same size circle and trace the plumes to follow, or you can stitch the plumes freehand. I will show you how to stitch the plumes freehand when we do the outermost plumes in step 8. I took the easy way out on the inner plumes and traced them from a stencil. -using soap or other temporary marker, draw a temporary circle around your outermost circle that will be your “boundary line,” or the target for the outermost plunge of each plume. If you deliberately stretch each plume to hit that boundary line, your plume size will be symmetric across the wreath. I used my compass to make this and literally spread its span to the widest diameter possible. This next shot is what the wreath looks like once all plumes have been added. I want you to look carefully at the plumes so you will see that they are not all uniform. They really aren’t, but they are close enough that the wreath registers as “believable” and the wreath is beautiful. I’m telling you this because we are all way too tough on ourselves as quilting critics and we need to get over it!!! This was a very fun way spend a day and I’m glad I did it! This was actually stitched as a trapunto layer, so it’s not done. I will hopefully be able to return to it soon and whenever that happens, I’ll post with some in process photos again. 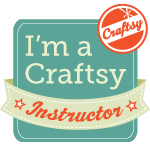 In the meantime, if you are wanting to learn more about featherettes and feathers, check out my Craftsy class called Ultimate Free Motion Feathers! If you’re looking for these templates in our online store, you can find them by clicking here. The feathered wreath above was actually made from the block I used to demonstrate how to use the templates in the video. It will actually have 2 trapunto layers in it by the time it finally is finished, but I’ll post how it got to this stage in the next few days. 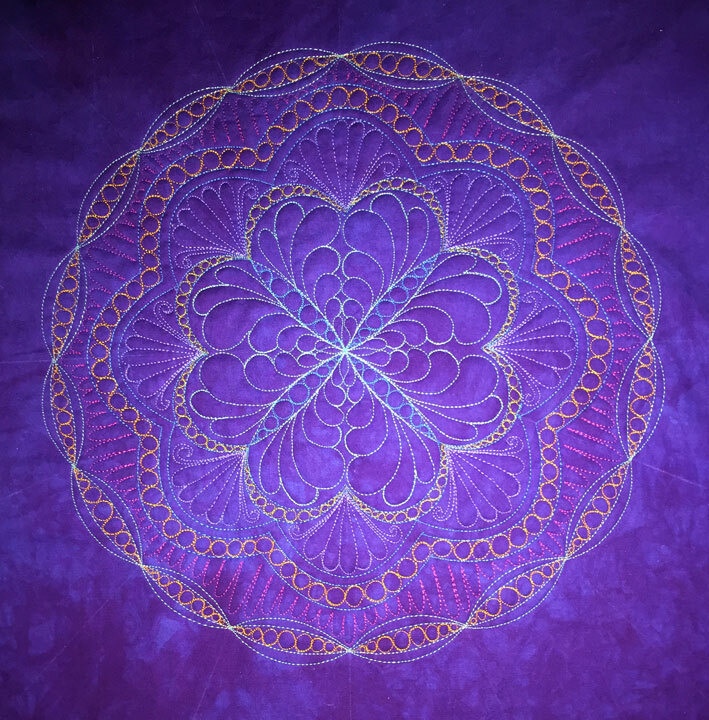 For now, just remember that it began by stitching 3 concentric flowers in the center of the block, and I’ll walk you through the rest of it as well! Sometimes I shock myself! Just finished this large feathered wreath. Will post details later of how it was made but now I am just basking in joy!